When hindrances confront us we must recognize them as opportunities to prove what we are made of. It is easy to move forward on a journey if the road is a four lane expressway with no bumps, curves, or detours to slow us down. But when faced with impassable roadblocks, if we persevere at the point of conflict, we will develop the character to wear the crown of success with true grace and honor. This book will push you to live above ordinary. It will take courage to move from ordinary to extraordinary, but you will not regret it. Others long to see something to emulate, a hero to look up to, a mentor to follow. Be that to someone. Our world needs strong leaders leading the right way. Decide to take your place and fulfill the destiny meant for you and you alone. I challenge you to move from ordinary living to extraordinary living, in every arena of life. Through hard circumstances, through tough personal assessment, through accepting others, as well as yourself, through personal growth in work and marriage, through an intimate daily encounter with God. Be extraordinary! Pamala encourages others to choose to make their lives Extraordinary. Ordinary takes no effort, it’s easy to coast through life, follow the crowd to average. But Pamala believes everyone can push past obstacles that keep you stuck in the same place having just ordinary relationships and small dreams. She gives step by step instructions to help you get unstuck and move forward to achieve more, dream bigger and live an extraordinary life. She has teamed up with lifetime friend and colleague David T. Moore to provide more even resources and insight on getting unstuck and moving forward to live the life you were destined to live. The Extraordinary Life! 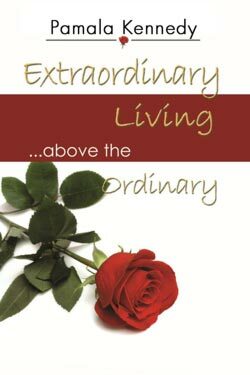 Buy “Extraordinary Living… Above the Ordinary” on Amazon.